Today’s guest post for Fit Bottomed Pets Week is from Mikkel Becker! Mikkel is a certified trainer specializing in dogs and cats, co-author of five books in the “Ultimate Pet Lover” series, and the resident trainer for Vetstreet.com. In her professional work, Becker uses positive reinforcement and non-force training strategies based in scientific learning theory. America’s four-legged inhabitants are fighting the battle of the bulge along with their human companions. 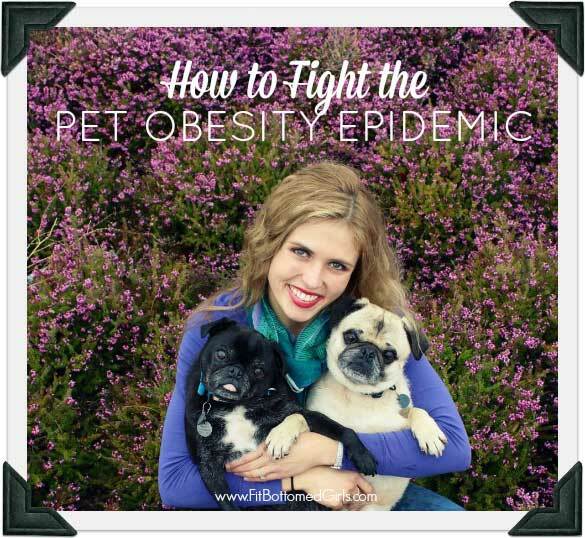 Not only are more than 50 percent of Americans overweight or obese, but the same can be said for their pets. We don’t hear them complain that their fur suit is fitting a little too tight or they’re embarrassed about their muffin top. And we certainly don’t find them staring at themselves in the mirror making resolutions to get in better shape come bikini season. Still, that weight definitely affects them, causing numerous health-related complications like an over-stressing on joints, increased pain, overheating, slowing down in their movement, breathing problems and more. It can even increase the risk of certain cancers, heart disease and diabetes as well. In the wild, it’s uncommon to see an animal that is rotund because the animal has to travel, scavenge and even hunt for their meal. Pets’ lives, however, are often sedentary with meals either free-fed or set down regularly in the food bowl, sometimes without measurement. Rather than working for meals, the animal is doing mindless eating that requires very little mental or physical expenditure. In addition, many pets are taking in more calories than they are outputting due to a lack of exercise, all leading to steady weight gain. Food is often equated as a sign of love, and that’s especially true with people and their pets. Most pets are not going to refuse a treat, even if they’re not hungry … or at least this is the case with my two Pugs that act like Dyson vacuums and will gladly swallow up any food put in front of them. What an interesting article! Lately my family has been debating whether or not my dog is overweight. I’ll definitely check up on it! I guess it is harder for a pet parent to accept that their pet is over-weight than them to accept their own weight. The problem lies with the activity levels, pets, people – everyone is doing less activities and taking more idle and rest times. Great info! We love our furr babies so much that we reward them with food everytime they look at us with their big beautiful eyes. These are great tips. Just keeping my 2 kitties from sleeping 23 hours a day is my battle. They eat, they sleep. That’s it. But feeding them a natural diet of grain free food has done more for their weight than anything else I’ve done. L.ately my family has been debating whether or not my dog is overweight. I’ll definitely check up on it!